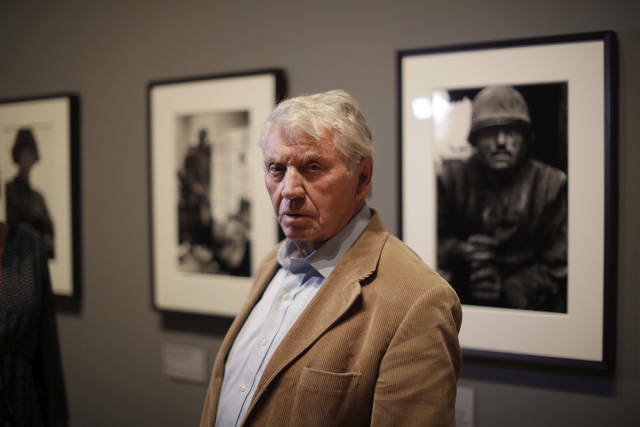 LONDON (AP) — Don McCullin’s most famous photographs burn with the physical and emotional brutality of conflict: a shell-shocked American soldier in Vietnam, a starving woman and child in Nigeria’s breakaway Biafra. But don’t call him a war photographer. The retrospective of more than 250 photographs opens Tuesday and runs to May 6 at Tate Britain , the country’s foremost gallery of U.K. art. But don’t call McCullin an artist. McCullin’s career began almost by chance, with a photo of young gang members he knew from Finsbury Park, the tough London neighborhood where he grew up. A shot of the group — “The Guv’nors” — standing in a bombed-out building, had a powerful combination of squalor and swagger that caught the attention of British newspapers. 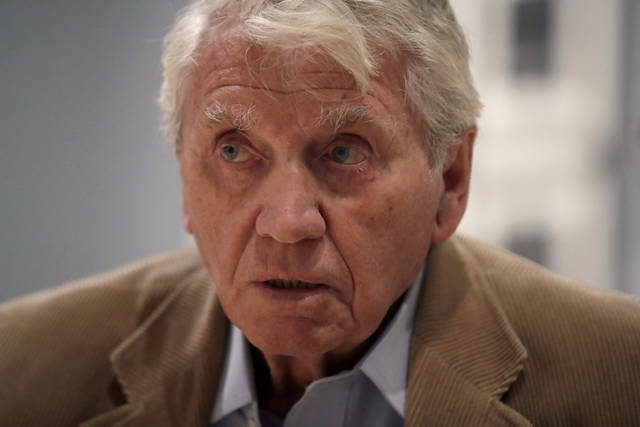 McCullin plunged into many of the 20th century’s conflict zones: Cold War Berlin, Biafra, Vietnam, Cambodia, Congo, Lebanon, Northern Ireland, Iraq. His images, always in black and white, powerfully capture the emotions of war — the raw grief of a woman in Cyprus who has just learned of her husband’s death; the devastation of an American GI; the exhilaration of youths in Northern Ireland throwing stones at soldiers. His lens looked just as unflinchingly at his home country. From the 1950s onwards, McCullin captured a side of Britain scarred by poverty, violence and decay. 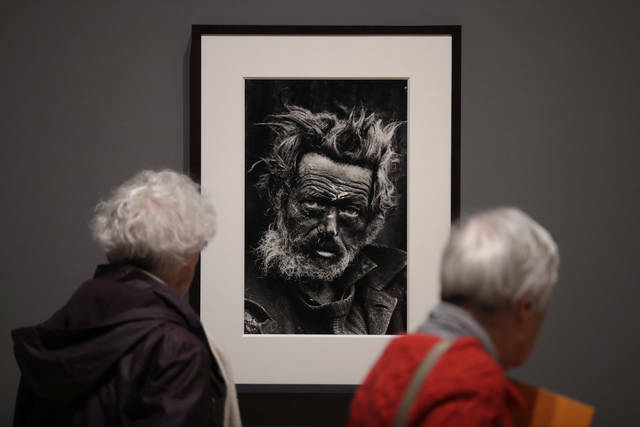 It’s tough stuff, though his images of holidaymakers at the seaside have a defiant cheerfulness, and there is great dignity in his close-up portraits of careworn and homeless inhabitants of Britain’s cities. McCullin survived physical danger and brushes with death. A glass case at the exhibition holds a Nikon camera that stopped a bullet hitting him in Cambodia. He didn’t escape an emotional toll, and in recent years has turned to quieter subjects — “to eradicate the past,” McCullin says in an exhibition note. Recent works include photos of the strange, watery landscape of the Somerset Levels near his home in southwest England. McCullin acknowledges that even these rural landscapes end up “looking like the First World War,” shot on black and white film — never digitally — and printed by McCullin with his signature in glowering intensity. He hasn’t abandoned war zones altogether. There are images of devastated Homs in Syria taken on a trip last year. McCullin has sometimes wondered if his work was worth it, since wars continue unabated. But he is amazed by how far it has taken him. “I grew up with quite a strong backbone, and I’ve kept it going,” McCullin said. “Now I’m getting old and lame and I’m having heart attacks and all that kind of stuff. I just think that’s part of the stuff I have to beat. Britain is due to leave the bloc on March 29, and many businesses fear economic chaos if there isn’t an agreement on the rules and conditions that will replace the 45 years of frictionless trade that came with being an EU member. The uncertainty has already led many firms to shift some operations abroad, stockpile goods or defer investment decisions. Nissan announced over the weekend that it has decided not to build the X-Trail model at its existing U.K. plant in Sunderland, England, canceling plans announced two years ago after May’s government promised to ensure the carmaker’s ability to compete after Brexit. The automaker’s decision is a blow to the government, which in 2016 offered Nissan incentives to stay in Britain. On Monday, the government published a previously secret October 2016 letter from Clark to Nissan promising up to 80 million pounds ($105 million) in support for the Sunderland plant. The letter also said Britain would “seek to maintain the closest possible economic relationship between the U.K. and our European partners” and would try to ensure that carmakers’ “ability to export to and from the EU is not adversely affected” by Brexit. With Britain’s Parliament at odds over Brexit, Prime Minister Theresa May gathered pro-Brexit and pro-EU Conservative lawmakers into an “alternative arrangements working group” seeking to break the deadlock. The group was holding three days of meetings with ministers and civil servants to investigate possible changes to the EU divorce deal, which was rejected by Parliament last month. May’s office said she plans to travel to Northern Ireland on Tuesday to meet business leaders and make a speech underscoring the government’s commitment to avoiding a hard border. But it’s less clear than ever how Britain plans to achieve this. EU Brexit negotiator Michel Barnier said that backstop remains “the only operational solution available” for an orderly exit of Britain from the EU. German Chancellor Angela Merkel also said the agreement couldn’t be renegotiated, although questions surrounding border arrangements could be addressed in a declaration on the future relationship between the EU and Britain. May hasn’t spoken to EU leaders since Wednesday, a day after British lawmakers instructed her to seek changes to the Brexit withdrawal agreement she had spent a year and a half negotiating with Brussels. PARIS (AP) — France’s yellow vest protesters were back on the streets Saturday to keep the pressure on French President Emmanuel Macron’s government and to decry the number of people being injured by police during anti-government demonstrations. Spain, Germany, France and Britain delivered diplomatic blows to Maduro’s rule by publicly supporting Guaido after giving Maduro a Sunday deadline to call a presidential election, which he didn’t heed. Sweden, Denmark, Austria, the Netherlands, Lithuania, Finland, the Czech Republic and Portugal also lined up behind Guaido, the self-declared interim president who also has the support of the United States and many South American nations.